This product is a non-selective herbicide that will kill any vegetation contacted. It enters plants through the leaves and moves down to the roots. This will ensure that the entire plant is killed. Avoid direct spray or drift onto desirable plants, lawn grasses, shrubs, and trees. Protect desirable plants and vegetation with a piece of plastic or cardboard. If desirable plants are accidentally sprayed, wash plants with water immediately. STOP Do not allow people or pets to enter the treated area until sprays have dried. Do not apply this product in a way that will contact any person or pet, either directly or through drift. Keep people and pets out of the area during application. Do not mow, cut or otherwise disturb treated vegetation for at least seven days following application. Do not use on or around edible feed or food crops. Do not make more than two applications per year to any given area. 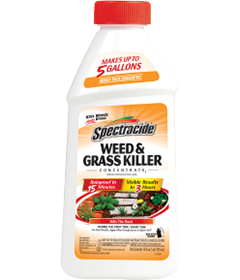 Do NOT use for spot weed treatment in lawns, since Spectracide® Weed & Grass Killer Concentrate2 kills all green plants, including lawn grasses. GENERAL WEED CONTROL: Use along fences, paths, patios, sidewalks, curbs and driveways, and around ornamental trees, shrubs, ﬂower beds and plantings around buildings. Use for trimming and edging landscapes. SPOT TREATMENTS: Spray directly on actively growing weeds in and around ﬂower beds, ornamental trees, shrubs, fences, driveways and walkways. LANDSCAPES: For use in preparing areas for planting of ornamentals, trees, shrubs, desert landscapes, rock gardens, ﬂower beds or similar plantings. Treated areas can be replanted one day after treatment. Determine size of area to be treated — measure length and width in feet, then multiply to determine coverage area in square feet (length x width). 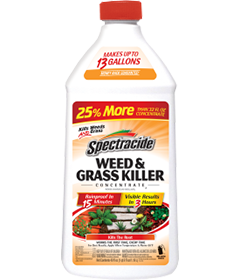 Use this product to remove the old lawn and existing weeds and grasses. For best results, apply in spring or fall, when daytime temperatures are at least 60°F. If the lawn is dry, water lawn every other day for a week before applying this product. Do not mow for seven days before or after treatment. Use 7 ﬂ oz (14 Tbsp) per gallon of water for each 300 sq ft of area to be treated. 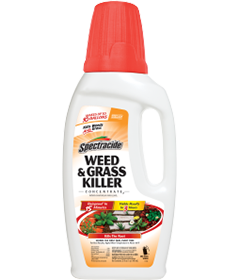 For best results, apply during warm, sunny weather (above 60°F) when weeds are actively growing. Rainfall or watering 15 minutes after application will not wash away effectiveness. To avoid drift to desirable plants, apply when the air is calm. All ornamental ﬂowers, trees and shrubs may be planted one day after application. Wait seven days after last application to rake, till or replant with seed or sod. Rake up and remove loosened thatch or debris. Mix in starter fertilizer and soil amendments, if needed. Level the soil. Apply seed according to directions on seed package, or install sod. Grass seed must have good contact with soil to germinate and grow. Keep area moist for two weeks to establish new lawn, then water as needed. Completely wet the foliage of the target vegetation. Do not overspray. A single application controls most weeds. Most treated weeds usually show initial symptoms within 24 hours and complete kill in one to two weeks. ‡ Visual symptoms and time to complete kill will depend on weed and grass type, temperature and application rate. Add appropriate amount of concentrate to 1 gal of water. Spot treat or spray evenly over 300 sq ft.
Set sprayer to the “ﬂ oz/gallon” level speciﬁed in the directions. Use only enough product for the area to be treated. Close sprayer, attach to hose and apply. Determine the amount of concentrate required. Pour concentrate into sprayer jar to the required “ﬂ oz” level. Add the required amount of water to the “gallons” level. Replace sprayer top on jar and apply. Step 1: Use a clean sprayer. Carefully measure and mix the amount of product and water as directed. Food utensils, such as teaspoons and measuring cups, must not be used for food purposes after use with pesticides. Step 2: Spray as directed. Thorough coverage is important. Flush sprayer with clean water after each use. 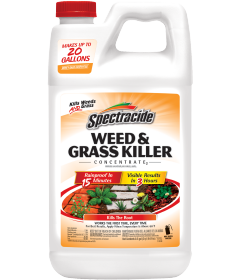 AMOUNT TO USE: To kill newly emerged weeds: 3 ﬂ oz (6 Tbsp) per gallon of water treats 300 sq ft.
For general weed control: 5 ﬂ oz (10 Tbsp) per gallon of water treats 300 sq ft.
Pesticide Storage: Store this product only in its original container in a secure storage area away from sources of heat or open ﬂame. Protect product from freezing. Pesticide Disposal and Container Handling: Nonreﬁllable container. Do not reuse or reﬁll this container, except as described for directions of use. If empty: Place in trash or offer for recycling if available. Hold eye open and rinse slowly and gently with water for 15-20 minutes. Remove contact lenses, if present, after the ﬁrst 5 minutes, then continue rinsing eye. Have the product container or label with you when calling a Poison Control Center or doctor, or going for treatment. You may also contact 1-800-917-5438 for emergency medical treatment advice. WARNING. Causes skin irritation. Causes moderate eye irritation. Do not get on skin or clothing. Avoid contact with eyes. Wash thoroughly with soap and water after handling and before eating, drinking, chewing gum, using tobacco or using the toilet. Remove and wash contaminated clothing before reuse. Wear chemical-resistant gloves made out of any waterproof material. Users should wash hands before eating, drinking, chewing gum, using tobacco or using the toilet. Users should remove clothing immediately if pesticide gets inside. Then wash thoroughly and put on clean clothing. Users should remove clothing and personal protective equipment immediately after handling this product. Wash the outside of gloves before removing. As soon as possible, wash thoroughly and change into clean clothing. This pesticide is toxic to aquatic invertebrates. To protect the environment, do not allow pesticide to enter or run off into storm drains, drainage ditches, gutters or surface waters. Applying this product in calm weather when rain is not predicted for the next 24 hours will help to ensure that wind or rain does not blow or wash pesticide off the treatment area. Rinsing application equipment over the treated area will help avoid run off to water bodies or drainage systems.